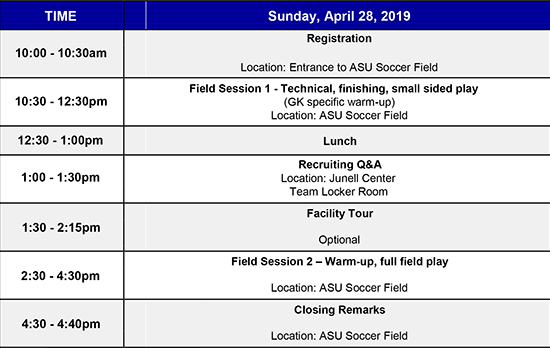 CAMP DESCRIPTION - Spring Soccer Clinic at ASU! Our goal is to introduce campers to the experience of playing elite level college soccer. We provide college level training sessions, coaching, and player evaluation. We aim to do this in a fun, competitive, and positive environment. The ASU Campus is equipped with a Lightning Prediction and Warning System called Weather Sentry (Telvent DTN). Should the Telvent DTN system send a text alert, the field will immediately be cleared and campers will be ushered to the Junell Center. In the event of RAIN, camp will go on as scheduled UNLESS the field is deemed unplayable and/or unsafe. At that point, we will go indoors and play futsal. There is a non-refundable application fee of $30. All refund requests must be made at least 1 week prior to the start of camp and must be submitted via email. No refunds will be issued within 1 week prior to camp. Serious injury or sickness may be a consideration.